Very easy to make, it takes about an hour to make a batch. Ingredients: 200g butter, 200g flour, 200g cheese (recipe said Gouda, I took parmesan …), 1 egg, nutmeg and pepper. Mix well and put in the freezer for 15 min. Roll out the dough and take out the X-mas cookie cutters. The original recipe suggested sesame seed, poppy seed and caraway as toppings with on some egg+milk mixture. 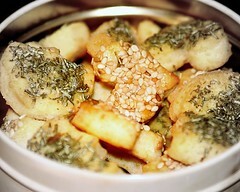 I used the sesame and some crushed rosemary with olive oil. I also sprinkled some salt on top. Bake for 10-12 min. at 200Â°C. Should keep well for a couple weeks in a jar, unless eaten. These are really good to accompany a nice evening watching episodes of the latest 24 series while it’s raining outside like it wasn’t August!